We often get questions about how to apply our wall decal stickers and sometimes problems that occur while applying. We've tried to answer these questions with videos on how to apply wall stickers and will respond quickly to any questions you may have on our Facebook page. Here are some frequently asked questions (FAQ) about our products and how to use them. Please Contact Us if you have any concerns or questions that aren't answered here. I put up my new decal stickers last night and they looked gorgeous! Now this morning, I see that there are few loose spots – like the sticker isn’t sticking to the wall as well in some spots. What should I do? First try to smooth the spots down with your fingertips. Do this a couple times a day and see if the wall decal starts to stay down. Most often, the bubble is a “memory” from how it was rolled in the package. If this step does not seem to be working, then get your hair blow dryer out. Heat up the wall decal stickers a bit to activate the adhesive and press the decal sticker firmly to the wall with your fingertips. Be VERY careful to not get it too hot as it can shrivel the wall decal, also. How do I remove the wall decal stickers? Removal is very simple! In most cases, you just peel it off the wall (fun job for the kids!). If you are worried about harming your wall surface (paint, wallpaper, etc) then warm up the decal stickers using a hair blow dryer. The heat will loosen the adhesive making them easier to remove. Are the wall decal stickers reusable? No, they are not reusable. The wall decal quotes are computer aligned and that is lost when you remove the wall decal. Our Wall Sticker Shapes can be carefully re-arranged but it is not best to store and re-use them. What is the background color? Actually there is no background. 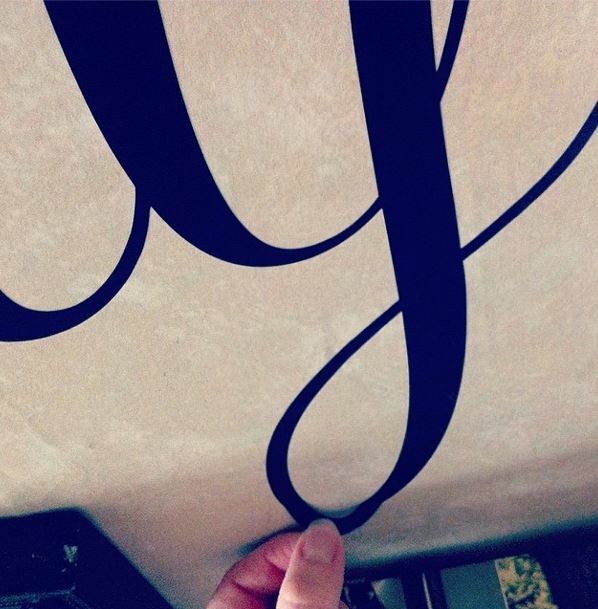 We make die-cut decals so the only part that stays on the wall is the actual design. All the other components of the wall decal sticker get discarded after application. Read more about die-cut decals in our Blog post HERE. Can I re-space the wall decal sticker design before I apply? Yes, you can. You can cut apart the design as long as you are not cutting through the actual wall sticker. Example: Cursive words are connected so you won't want to cut apart the letters of cursive words. Watch this video to see how we re-spaced a dandelion wall decal.